* Aches and pains that come and go as your stress increases and decreases? *Cluttered Mind or Full brain making it harder to think and make decisions? You know there is help out there to reduce your stress, some of you even have tools, but you just don’t get the help or use the tools. You want to reduce the impact stress holds over your “life”, your body, your mind and your emotions. BUT you’ve told yourself life gets in the way. “Life” is often code used by the voice in your head, whose job is keeping you safe. YET, the voice confuses CHANGE with potential hazards and adds roadblocks to your thoughts. The voice keeps you from using tools and reducing your stress OR sabotages you when you’ve begun embracing steps to help yourself. You think you’re just not someone who CAN do _____ and get relief. You avoid making any changes because you can’t figure out HOW to fully and sustainably integrate changes into your life. This is why I’m so excited to launch Sacred Stress Solutions. This is NOT a one-size fits all workshop. This is NOT a class that you go to and feel great about; and then try new skills for a few days or weeks and forget. Sacred Stress Solutions is a “transformational impact experience” because I’m there as your personal Sacred Stress Solutions mentor, your personal trainer of stress relief. I help you build a transformative tool box of tools that meet you in your life where you are NOW and begin providing you immediate and long term results. You learn quick and easy fix customizable tools and long term tools to fill up your Stress Relief Tool box. You’ll understand the difference between Acute and Chronic stress so you can recognize which you experience and what you can do to get relief and feel more ease. You take the tools for a test drive while we’re together determining what works for best for YOU and support for moving past any obstacles keeping you from tapping into more ease in your life. I take you through a process that helps you recognize your stress patterns and how stress impacts you. (EVEN if you think you know, you’ll uncover the hidden stress you may not be aware of). Your new awareness helps you choose tools that truly help you reduce the agony you feel and fit in your life so they’re easy to use and you’ll do them. Don’t worry about that voice that throws up the roadblocks, I’ll teach you how to handle that voice and either befriend it or put it in its place. You create memories in your body and your mind while we’re together so you begin integrating the tools right away. As my gift to you, I give you access to the audio electronic version of the event to watch over and over further integrating it into your life, supporting you and the notes you took and reminding you of the experience each time you listen. I’m here to help, I know I can help and I want to help you. I’m sharing with you tools that saved my life. They help manage chronic ongoing stress. That’s the stress that is so ongoing that sometimes you don’t even realize the impact its having on you. The tools also serve acute stress helping you bounce back quicker. Acute is the more daily stressors and big trauma events. I am hugely passionate about Sacred Stress Solutions and how it can support your relief from a variety problems, induced by stress. Problems you may or may not realize are caused by stress. 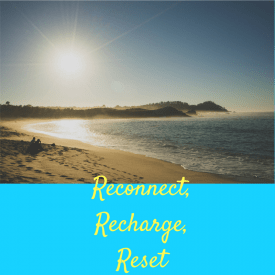 I created Sacred Stress Solutions to help you begin transforming your life and tapping into ease. Ease is the polar opposite of stress and leads to more happiness. DO you want more happiness? Ease is the answer. Join me so you can finally commit to solutions that will serve and support you — no matter where you are starting– while providing a reprieve from stress right away. 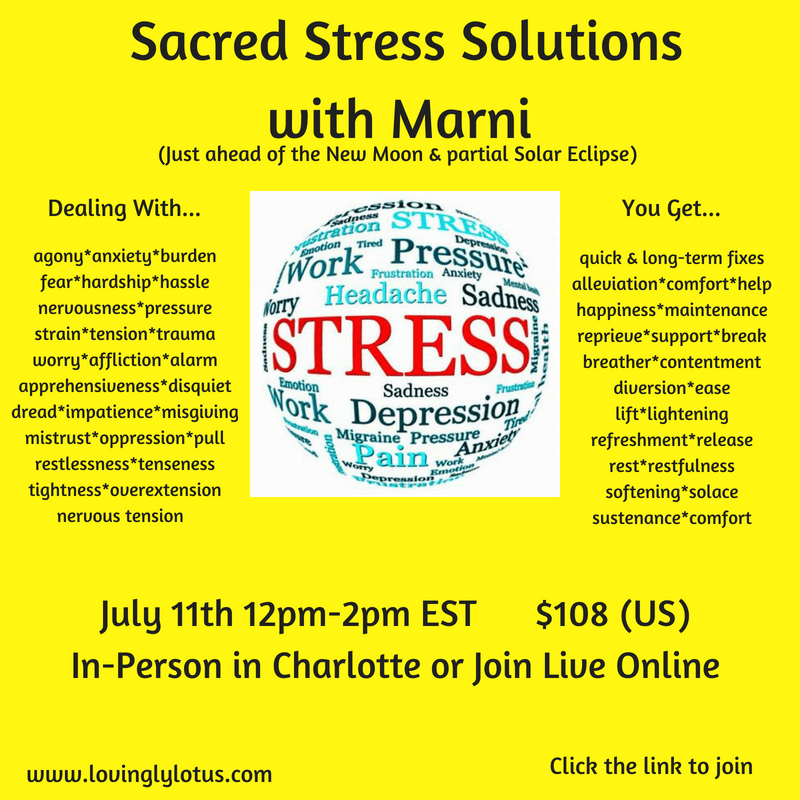 Join Sacred Stress Solutions in-person or online. Many of my clients resisted this support at first and gave me lots of reasons why it couldn’t work for them. I tried solutions but they just didn’t work for me. I have too much going on. I’m not the kind of person who can ________. I can’t figure out where to begin. I did it for a while and got off track and now I don’t know how to get back. I’m just not someone who’s consistent. I don’t have or want to spend the money on me. Each client who said YES to this jumped into working with me, creating practices that met them exactly where they were — and they feel SO good, they’ve never looked back — except in gratitude. Their lives changed significantly at work, at home, inside themselves, and in relationships. Join me on Wednesday July 11, 2018, 12pm-2pm EST either in Charlotte in person or online. I’ll walk you through easy tools, many you can take anywhere and will help you right away. We’ll experience the tools together and have fun doing it. You’ll have the opportunity to receive one-on-one support from me to create practices meeting you in your life today and they’ll grow with you. People pay thousands to get personal support like this. My mentor thinks I’m crazy, as she put it, to “GIVE THIS AWAY” for $108. Here is where you say, YES, I’m in. Click Here to complete your payment and registration. 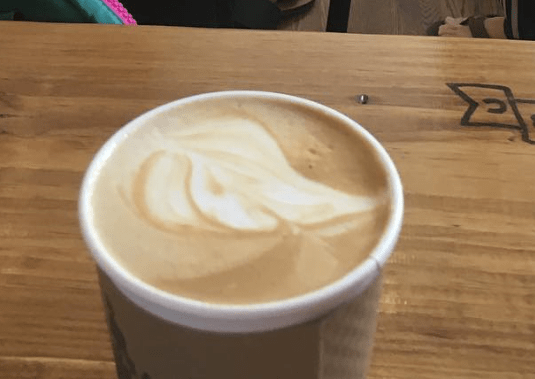 Conscious Coffee Convo, C 3: A free conscious collective conversation where I answer questions, share some powerful tips and support you taking the next step in your incredible journey. If you are feeling stuck, stale or avoiding and you either know why, want to know why and are looking for ways to energize , then say YES. What will it take? An hour of your time and if you buy a cup of coffee, the cost of that. To keep this intimate, it is limited to the first 10 RSVPs. Keep your eye out for the next date.